Come See Us at FABA! We are super excited to be attending the 2017 Conference in Daytona Beach, FL. Missy will be co-leading 2 different workshops on Wednesday and she will be speaking in a symposium on Friday. Come see her and the co-presenters: Tim Courtney, Megan Miller, and Laura McKee. Dr. Jon Bailey is serving as the discussant on Friday. This is not to be missed! We will be sponsoring the happy hour on Wednesday night. We will buy you a drink if you come see us and mention that you saw this on our blog! You know, I like to be positive. But today on this International Autism Day (AKA Light It Up Blue #LIUB), I’m not getting the feeling that we have the “awareness” we need. And it makes me ANGRY. Yes, I’m happy that thanks to Autism Speaks we have 45+ states with insurance mandates! Children identified EARLY. Pediatricians should lose their license when they send a family away and tell them to wait. REFER! A licensed clinician, with expertise in early identification, can determine if it’s autism. When the child is diagnosed, early intervention happens IMMEDIATELY without waiting lists or delays. Every child should be able to receive applied behavior analysis (ABA) therapy at the intensity recommended by the professional and based on assessment. This should be without regard to race, native language, socio-economic status, or type of insurance coverage. If you want to know more about ABA, read here. Every child with symptoms should be screened for appropriate medical treatment of any GI problems such as reflux, constipation, diarrhea, or food allergies/insensitivities. Every child should have access to quality behavioral feeding intervention if assessment indicates it is warranted. Until these things happen, I will stay mad or “I mad” as one of my clients told me recently (when he found out he couldn’t have chocolate ice cream.) Go ahead, light it up blue but let’s turn awareness to ACTION! We are pleased to announce the launch of our new website! It is the same URL address, just new updates to make it easier for mobile users to stay in touch. Our applied behavior analysis (ABA) team has worked hard to complete professional photos, update bios, and introduce our new behavioral feeding page! Don’t miss our upcoming webinars for 2017. We offer group rates for 3 or more individuals from the same agency who are taking the course from separate computers. Our best discount is for groups who will share a computer during the webinar! Register 1 person at full price and all others are only $10! That’s right, $10 for the whole course when you share a computer. To register, simply visit our website here, scroll to the very bottom, enter your name and other pertinent information, enter an abbreviated title, and follow the link to PayPal where you may pay with your account or with any credit card. We also accept purchase orders from school districts! Did you know that ABS has a monthly journal club where you earn 1 CE each month? Did I mention that the Journal Club is FREE? All you have to do is join the club, read the article, and be present for the discussion. Email the info line at: info at applied behavioral strategies dot com to join the journal club. If you haven’t been to our page in a while, hop over for a visit to meet our amazing team of BCBAs. (As an aside, we are currently hiring full- and part-time BCBAs. If you are bi-lingual Spanish, we would be thrilled. We are also hiring part-time behavior therapists.) Come join our awesome team! And finally, if you just want to stay in touch, join our mailing list here. We are registered to do business in Tennessee! We are so thrilled to be expanding and to soon be offering services to children with behavioral challenges and their families. We came across a new video about autism recovery that we are excited about! One of our parents actually found it first. When the mom talked about it, I just assumed it was another CARD video as they have been the predominant leaders in this area. Interestingly, it was not from CARD but rather a professionally produced video from UCONN! We have been a fan of Dr. Fein since we first learned that she studied children on the spectrum. See one of our previous posts here. She is not a behavior analyst but rather a licensed clinical psychologist. She is not in the business of ABA but rather a professor in clinical psychology. You can read more about her here. So…..now for the video. We hope it inspires you as much as it does us! Hi and welcome to What Works Wednesdays where the focus is usually the description of a successful case story. Today’s story actually comes from a popular video. In this video, the photographers captured the faces of several young children as they tried new food for the first time. Matt Gilmour, the creative director and Hugh Miller, the cinematographer, capture the children’s reactions in 500 frames per second. As a BCBA who has helped many, many children learn to eat new foods, I cannot help but recognize that the children in this video are not scared. The children in the video are willingly trying new food. Sadly, for children who have autism, trying new foods does not look like this. Trying new foods can result in aggressive behaviors, self-injurious behaviors, even vomiting! However, after effective behavioral feeding therapy, children with autism can learn to try [and like] new foods. If you have a child who engages in picky eating, reach out for assistance from a behavioral feeding program; mealtime does not have to be stressful. Hi Marie and thanks for stopping by the blog. You are not being sold “quackery”. The truth is that children with autism CAN recover–even lose the diagnosis. I have written about this before (here, here, and here), which is probably how you found this blog. 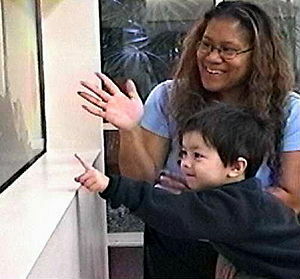 Applied Behavior Analysis (ABA) therapy is the only treatment that has been proven to help children recover from autism. Dr. Lovaas is best known for his study describing the improvements of almost half the children who received the treatment. Other scientists have replicated his research with similar outcomes. Unfortunately, scientists do not yet know which children will recover, only that some recover. We do know that intervention must start early, it must be intense (40 hours of therapy per week), and that it must last for 2 years or more. We also know that therapy must address all areas of development including speech and language, social and emotional skills, gross and fine motor, self-help and adaptive skills, as well as academic skills. out this resource to see if your state is included. You may also find some of the work by Dr. Fein helpful. She has no association with ABA whatsoever and she has published several papers on this topic as well. Finally, we know that many children on the autism spectrum are sick. The illnesses include GI disease, food allergies, mitochondrial disorders, and other things. Thus, in addition to using ABA to teach your child, you will need to include medical support to address any underlying medical condition that your child may have. I am sorry that your child has been diagnosed but I hope that you will pursue active treatment as soon as you possibly can. If you have a question email askmissy at applied behavioral strategies dot com.